It’s been asked of me a few times to provide some guidance around how one acquires the music being reviewed on this blog. Here is a straightforward walkthrough that will help you get your ears on the music. First, the gentle reminder that while both SBDs and AUDs can be streamed online for listening enjoyment only the AUD tapes reviewed here can be downloaded for personal consumption away from the Internet. The Grateful Dead Listening Guide does not provide, nor link to, SBD files for download or trade. There are a couple of tools (applications) you will need to get which then help you render these shows into a listening format. These are freeware, and protected from viruses, etc. You can safely download these and run whatever install wizards they trigger when you click on their set up or .exe file. WinRAR: You will need this to unzip the song files if/when you download a MP3 version of a show in zipped format. Traders Little Helper: You will use this handy gem if/when you want to create WAV files out of the music files you download for burning to Audio CDs. That’s it. Just two. Get them now. Go on. It’s easy. Now we are going to walk through the process of getting shows downloaded in two ways (it just comes down to the type of file format you want to end up with). Not being well versed in the Mac platform, I’m only going to cover the basics in Windows (XP in particular). I’m pretty sure that this walkthrough should turn on enough light bulbs such that a Mac user could figure things out. First we will walk through getting the show in a good quality MP3 format, ready to load onto your iPod or player of choice. MP3s are a “lossy” format, called such because in compression of the original files there is some sonic degradation. It’s minor, and up to you whether you care at all. Speaking as a guy who swore up and down that lossy MP3s were the work of the devil back through the years when I was transferring masters and seeding shows online, I can tell you that for my own listening pleasure I only deal in MP3s. My ears are perfectly happy with this format for casual listening enjoyment. Since returning to the Dead, and starting this blog early in 2008, I’ve only listened to shows in the MP3 format on my iPod. I haven’t burned a single disc for listening. Second, we will step through getting the files onto your computer in a “lossless” format (SHN, FLAC), and what you’ll need to do from there to listen. Lossless will provide you the exact music files as they came to digital. Pure pure pure. 1. Click On The Link – Clicking on that link will take you to the corresponding page on www.archive.org where that show is waiting for you. That’s all there is to step one for downloading a show. Now you will be at the archive.org website, on that show’s particular page. On this page are a lot of links that you could click on. We are going to concentrate on just one. In the upper left side of the page is a box/section with a Steal Your Face logo at the top, labeled “Listen to audio.” It looks like the image to the left. 2. Right click on the link that says, “VBR ZIP” under “Play / Download." If you are using the Mozilla Firefox browser, select “Save Link As…” If you are using the Internet Explorer browser, select “Save Target As…” A navigation window will open up allowing you to decide where you want to save the file. Perhaps this would be a good time to create a folder in your “My Music” folder that you call “Grateful Dead Shows.” Regardless, click “Save” or “Okay” (depending on browser)and allow whatever time is needed for you to get the file saved on your computer. This will unzip the file directly in the same folder you're in, and produce a folder containing the entire show in correctly named, individual MP3 tracks ready to be added into your favorite music library management application. 4. Listen to the music. 1. Click On The Link – Clicking on that link will take you to the corresponding page on archive.org where that show is waiting for you. That’s all there is to step one for downloading a show. Now you will be at the archive.org website, on that shows particular page. On this page are a lot of links that you can click on. We are going to concentrate on just one. In the upper left side of the page is a box/section with a Steal Your Face logo at the top, labeled “Listen to audio.” It looks like the image to the left. 2. Now, the FLAC or SHN files are not zipped. You can actually see them all on the main page with clickable links denoting file size under a column labeled “Shorten” or “Flac.” You could start right clicking on these links directly to pull down each file individually per the instructions above in MP3 Downloads. Or you could click on the bottom-most link in the “Listen to audio” box that says “HTTP.” This will take you to a simple page that shows all the files on the page you might want to download. In Internet Explorer, right clicking on each SHN or FLAC file will allow you to save them one at a time, or in Firefox, you might want to make use of the DownThemAll! Plugin to make this a faster experience. Save all the files into a place you can easily get to when finished downloading – perhaps a folder you name with the date of the show. 3. Once you have all the files saved on your computer you’re just about ready to listen. FLACs can be played in many different applications as is. SHNs, not as many. If you want to burn the files to Audio CD’s, you’ll first need to us the Traders Little Helper to convert the files into WAVs which can then be burned to CD via a myriad of applications including Windows itself. Traders Little Helper is extra intuitive. You shouldn’t have too much trouble using it after the first try or two. I hope this helps. Let me know if it doesn't. The Listening Guide is no good if you can't LISTEN. Hey Now. This is truly an amazing page. the music access is healing and so helpful to me nowadays. Just wondering how i can, after downloading a file into my computer and windows media player,send it to my i-tunes player to be able to play it on an ipod. Is that even possible. how can i put the music onto an ipod. Thanks so much for sharing the light in music here. Once you have successfully downloaded a show to your computer and have each individual mp3 song file sitting in a folder, you can just drag and drop that folder directly onto the word “Music” under “Library” in the upper left of your iTunes screen. 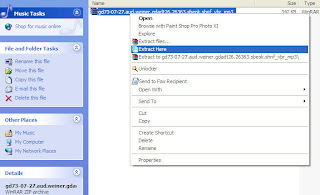 That, or use the File>>Add Folder To Library function in the drop down menu. It sounds like Windows Media Player might be set to control and play all music files on your computer, but that won’t stop you from putting mp3s into iTunes. You can probably change that setting too, if you want to, in the options menu of WMP. i do have a question...most shows i have downloaded will have a break inbetween the songs, and sometimes the break is spaced before the song ends, which of course really dampens the mood. i know some people can achieve seamless shows and others cant, but is there a way to dwnld a show as one saemless file? The break between songs may be due to a setting in your music player. In iTunes go to Preferences -> Playback and uncheck the crossfade.